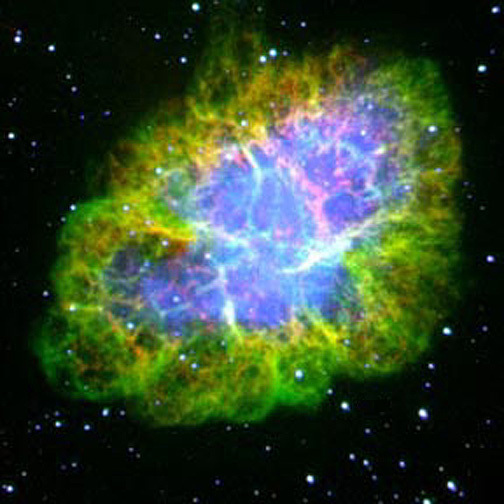 6,000 years ago, the remnants of a supernova were swirling away into space. 7,000 years ago, other clouds of dust and gas were very slowly condensing and ultimately giving birth to new stars. 8,000 years ago, the Trumpler 14 star cluster, made up of very young stars only half a million years old, twinkled serenely in the night sky. 9,000 years ago, a huge cluster of stars was shining, barely visible from earth (except in infrared wavelengths), obscured by dust and other interstellar matter. 10,000 years ago, the aging stars in the NGC 2420 cluster were shining calmly, if a bit reddishly, due to their 1-billion-year age. There’s lot’s more, of course. In fact, if you visit atlasoftheuniverse.com, there’s even a map of all the nebulae and star clusters within 10K light years of Earth—with a companion map out to 20K light years. Remember, these are not illustrations or artistic renderings of any kind. Light takes time to get from there to here, so by the time we see it here, we’re seeing what was happening in the past. When we look at the parts of the universe pictured above, we’re seeing 6, 7, 8, 9 and 10 thousand years into the past, first-hand, eye-witness stuff. And these sights are visible to everybody. You don’t have to “believe in” Darwin or disbelieve in Genesis. You can even be an ordinary camera, with no beliefs or preferences at all. The same sights are visible and recordable to everybody. So the next time someone tries to tell you that six days of creation were happening 6 to 10 thousand years ago, ask to see the pictures. It’s not like we can’t see what’s really out there. It’s stuff like this that really makes me shake my head at YECers. Have you ever had a Christian bust out the rich man and Lazarus story? What’s ironic about the “Rich Man and Lazarus” story is not just the claim that a genuine resurrection would fail to convince, but the reason why an isolated resurrection would be unconvincing. Someone coming back from the dead would indeed be a nice “gee whiz,” but if there were really a God Who was willing and able to die on our behalf and then raise Himself from the dead just so that He and we could share a tangible, personal relationship for all eternity, then the consequences of His desire and power would make miracles unnecessary. Jesus treats the raising of the dead as the most awesome thing in the world. “Anyone who would deny that,” he seems to say, “would deny anything.” But if God really cared about us, then the most fundamental, obvious, and even trivial consequence would be that He would show up in real life so we could all participate in that relationship He allegedly died to procure for us. And that “trivial” evidence would suffice to convince pretty much everyone—no miracles necessary. Jesus has it exactly backwards. Look at it this way: two young men are trying to win the affection of your teenaged daughter. One shows his feelings for her by being there when she needs him, lending a hand when he can, spending time with her, and taking her out now and then. The other tries to prove his love by concocting an elaborate scheme to have some hoodlums beat her up, and then, at the last minute, provokes them into beating him up instead, so that she escapes injury and he almost dies. Which of these two convinces you that his love is sincere? Bizarre showmanship is no substitute for consistently showing up. Not to disagree at all, but I had a YECer try to explain to me that the speed of light is changing, I don’t remember if it was speeding up or slowing down. Also the astrophysicists are wrong about the age of stars, etc. since they don’t even know that light is changing speed. He ought to know, he is an hvac tech after all and kinda understands a bit about electricity and refrigeration. For some real fun, point out that the speed of light (c) is related to the amount of energy in the famous equation e=mc2. In nuclear fusion, a fraction of that energy is released, but it’s still proportional to the basic formula, so doubling the speed of light (c) would increase the energy output of the sun by a factor of 4. To achieve a speed of light that’s anywhere near the speed needed to cross trillions of light years in only a few millennia would result in a sun that would quickly cinderize the planet earth before blowing apart the sun itself. On the other hand, it would leave Adam with a really spectacular tan for a few 100ths of a second.